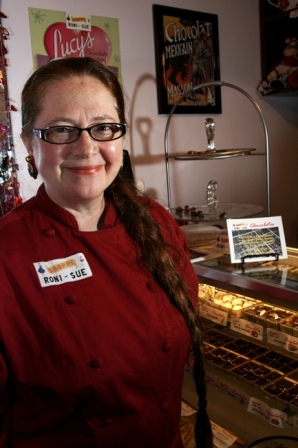 Meet Rhonda Kave, entrepreneur, chocolatier, and owner and operator of Roni-Sue's Chocolates. Rhonda has made chocolates for over twenty-five years as a passionate hobbyist, informed by years of cooking and baking courses at the New School & Peter Kump/ICE. After an intensive workshop with master chocolatier/teacher Jean-Pierre Wybauw she opened Roni-Sue's in October 2007. A big believer in continued learning and professional development, Rhonda frequently spends time in Belize with the farmers who grow the cacao beans for her chocolate. Kave draws inspiration from exploring both exotic and local markets to find new and special ingredients for her unique handmade treats. She builds a 'flavor profile' for each of her candies—layering different elements to create a complex and nuanced expression of that essential flavor. Prior to opening Roni-Sue's, Rhonda was a professional women's advocate for over ten years. She continues her lifelong connection to the National Association of Mothers' Centers serving on its MOTHERS advisory council. Rhonda earned her BA in Sociology from NYU as a returning learner in May 2007 where her research paper focused on farmers' markets and sustainable agriculture in NYC. Roni-Sue emphasizes working with our neighbors to build relationships and strengthen communities. Roni-Sue Chocolates has collaborated with many institutions, clubs, schools, and non-profits including City Harvest, Share Our Strength, The Lower East Side Girl's Club, Coalition Against Domestic Violence, Bella Abzug Leadership Institute, Big Brothers/Big Sisters, and City Limits/City Futures.